It's Friday morning in a London hotel suite, and Oscar-winning film-maker Jordan Peele is impersonating a rabbit. It's not a famous rabbit - we're not talking Bugs or Peter here. But his imitation of one of the bunnies that appear in Us, his much-touted follow-up to 2017's Get Out, is pretty uncanny all the same. "I make cameos in my films as dying animals," reveals the 41-year-old, who follows up his chilling leporine screech with the agonised low moan he gave an expiring deer in his previous directorial effort. Things have clearly taken a strange turn - though it's not half as strange as the one that awaits both the protagonists of his latest offering and the audiences who see it. Get Out, for which Peele won an Oscar for best original screenplay, told of a young African-American who lives to regret spending a weekend with his white girlfriend's parents. The film opens with Gabe (Winston Duke), Adelaide (Lupita Nyong'o) and their two young children heading to Santa Cruz for a carefree beachside holiday. It's not a social call either, as their crimson-clad twins - who have hitherto eked miserable existences in the shadows - seem intent on punishing the Wilsons for their lives of ease and privilege. "You always have to start with something that scares you," declares Peele, whose background in sketch comedy manifests itself in the dark humour underpinning his feature film work. "The idea of encountering myself with no warning always just dropped my stomach out from under me, so that was the first thing I thought of. "When you're writing a horror movie, you want to take something like that that works on a primal level," he goes on. "The fear of the doppelganger is really the fear of self - the fear of that which we suppress as individuals. What is the shadow version of ourselves?" 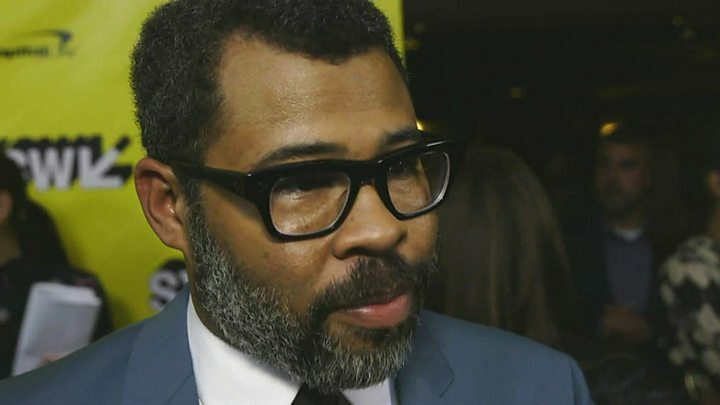 Peele admits his homeland was "at the forefront of his mind" while writing the film, though he stops short of naming its current leader as a primary inspiration. "As a nation we tend to fear the outsider," he elaborates. "We point the finger at the mysterious invader, and that xenophobia has sort of been fuelled. "We also point the finger at people who aren't like us, who didn't vote like us, who live across the street from us. This movie is about the notion that maybe we are our own worst enemy." Duke, best-known for his role as Wakandan warrior M'Baku in Black Panther, had little time for the horror genre before Get Out appeared. "The horror genre was never one I felt comfortable with because black people always died," he laughs. "They were always the first casualties, the first sacrifices. "After Get Out I was like 'wow - we can use this genre to do a lot of interrogation of culture, individuals and political movements'." According to Duke, benign patriarch Gabe is defined by his possessions, his home and "his proximity to the American Dream". "If you buy into the American Dream, you also, to some degree, have to take on accountability for the sins of how that's attained," he says. "We've built a country of great privilege on the back of one of the greatest murders of all time, the genocide of the Native American," says Peele. Image caption Nyong'o, pictured with Peele, calls the film's "unremarkable" black family "refreshing"
Yet Us has an alternative resonance for Nyong'o, who finds it "refreshing" that it revolves around an "unremarkable" black family whose plight "has nothing to do with the colour of their skin". "I don't live my life always considering the colour of my skin, so it was nice to have a family we could project our own understanding of a family on to, no matter what colour our skin is," says the 12 Years A Slave actress. Not only that, but Peele also has a voice role in the upcoming Toy Story 4 - playing, coincidentally enough, a fluffy toy rabbit. "I started recording Toy Story a couple of years ago so it pre-dated Us," he clarifies. "But maybe, subliminally, I was forcing that synchronicity." Yet Jordan's relationship to rabbits is far from an affectionate one. "I'm not afraid of them but I do find them scary," he confesses. "They're very cuddly but they also have a sociopathic expression, and they kind of look past you in a creepy kind of way. "Not the biggest brains, rabbits."